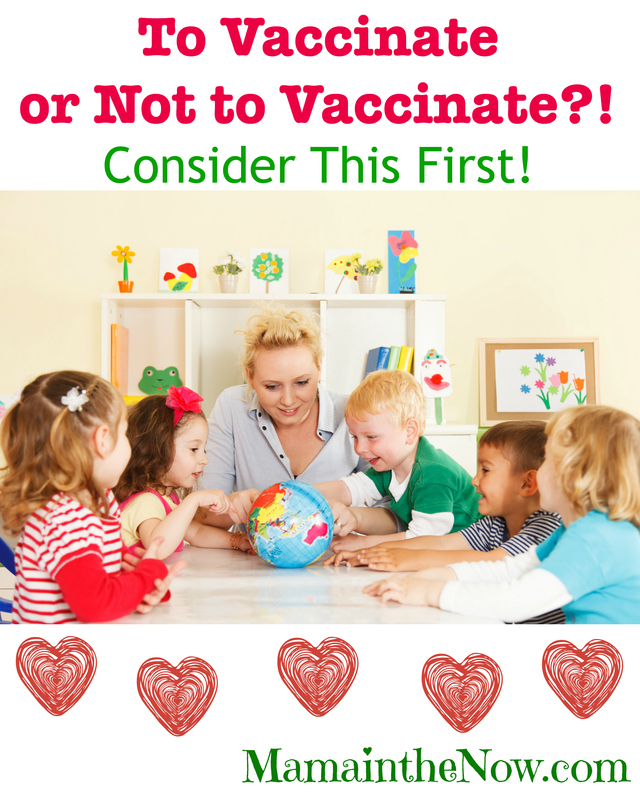 To Vaccinate, or Not to Vaccinate?! Consider This First! The topic of “vaccinations” has been weighing heavy on my mind for a while. I felt that my silence was not a good representation of my (strong) feelings, when out of the blue, a dear friend wrote this piece and asked if it was appropriate for my blog. Yes – and 110% YES! I am proud to feature this guest post. Although the words were not written by me, I completely stand behind her message. Please read – and leave an encouraging comment for this incredible mama – she’s on a journey much harder than you can imagine. Social media has become a breeding ground for the vaccination debate. Comments on blog posts are battlefields for why vaccinating or not vaccinating is bad for your child. The references to facts and evidence based practice are non-existent when it comes to the reasons why you should not vaccinate your child, yet there are a growing number of parents choosing to follow this dangerous path. Not vaccinating is dangerous for your children, but IT IS ALSO DANGEROUS TO MINE! NOT VACCINATING YOUR CHILD COULD KILL MY CHILD. That is not an inflammatory accusation; it is the plain and simple truth. One of my twin boys was born with half a heart, so from day one the option to vaccinate or not vaccinate was not an option at all – Camden, and his twin brother Nolan, would be vaccinated in order to protect Camden’s medical status. Tragically, this is not the end of my public service announcement on vaccination. Camden had open heart surgery at 4 months old. 2 days into his recovery, he contracted VARICELLA (Chicken Pox) WHILE IN THE HOSPITAL. At 4 months old, he was too young to have received the chicken pox vaccine and was therefore relying on the rest of our community to protect him from this terrible virus. Contrary to what antivaxers will tell you, the chicken pox CAN KILL a HEALTHY CHILD, never mind a child with half a heart two days out of open heart surgery. The fact that Camden is still alive today is a miracle and a testament to his innate zest for life. Due to the chicken pox, Camden suffered a major stroke, was on life support for 2 months, lost all movement on the left side of his body, has major feeding issues, lung issues, seizures, a much more severe heart condition, and a dismal prognosis. Again, tragically, this is not the end of my anti-vaccination tirade. Because of such an early exposure to the chicken pox, Camden is unable to hold titers to vaccines (I will explain how this also affects your healthy children) and he does not have a functioning immune system. Every sniffle or cold sends him to the cardiac ICU. So, Camden RELIES on the rest of his COMMUNITY to be vaccinated in order to PROTECT him from communicable DISEASES. If a common cold sends Camden to the cardiac intensive care unit for a weeklong stay, can you imagine what the measles would do?? For the first 3 years of their lives, my children have either lived in the hospital or in a tiny bubble of protection and lack of interaction from the outside world. At age 3, I found a wonderful rehab- center preschool to enroll them in where Camden could receive therapy to treat his hemiplegia and gross developmental delays (just a few of those wonderful after effects of the chicken pox I mentioned). The center also included typically developing children like Camden’s twin Nolan, making it a wonderful learning environment for both of my children and their first chance to interact with their peers. However I recently found out that a student in attendance of the program is not vaccinated. She has the proper state approved waiver exempting her from vaccinations, so legally there is nothing that I can do other than pull my boys out of school, which is exactly what happened. I find it infuriating and disheartening that after everything my children have been through, this one freedom has too been taken away from them because of the current trendiness of not vaccinating. Why would an unvaccinated child attending preschool be a concern for parents of typical children and not just a concern for my family’s unique situation? Have you had your children’s titers to vaccinations checked? Do you know for a fact that they are fully protected from communicable diseases like chicken pox, measles, and pertussis? Blood titers tell you whether your immune system holds enough of a vaccine to protect you from contracting a virus you have been immunized against. For example, I had Nolan’s titers checked when we learned of Camden’s immune deficiency. Nolan has been fully vaccinated and I was under the illusion that he was therefore protected from said diseases. However, his blood titers showed that he was not protected against the MMR or DTap sets of diseases. Nolan has since received boosters to these vaccines and is now fully protected. Unless you have your child’s titer levels confirmed, YOUR VACCINATED CHILD could be in a classroom with an UNVACCINATED CHILD and still get the communicable DISEASE you think they are protected from. And another unfortunate symptom of the aforementioned communicable diseases is that an unvaccinated child could be carrying one in their body for days to weeks before ever showing symptoms. So, if you think your children are protected if the school’s policy is that unvaccinated children can attend until there is an outbreak or they themselves show signs of a communicable disease, THEY ARE NOT. I hope my perspective on vaccines encourages you to get the facts (evidence based research!) when you make vaccination decisions and to also think about the rest of your community. Think of the childhood cancer patients who need the protection of the vaccinated community. Think of your newborn baby whose older sibling attends school. Think of the medically fragile children who rely on HERD IMMUNITY. Think of Camden. Please remember to leave Camden’s mama an encouraging message! She deserves to feel a village of supportive mothers around her! Thank you so much for sharing! I am so sorry that you had to pull your boys out of school. I firmly believe that if you don’t want to vaccinate out of your own personal CHOICE, then you should homeschool. I appreciate the reminder about boosters. I need to get my kids checked, especially with another baby on the way. This whole anti-vax movement has made me so angry and frustrated with what people blindly believe, without basis on facts. I hope you and your sweet family stay healthy! Thank you for your kind words. The boosters are so incredibly important to remember – and one thing that doctors forget to tell us. This post really opens up my heart. Yes, I do vaccinated my children, because here in Singapore, those vaccination is compulsory for them. Yet, deep inside my heart, I am debating whether I should have not vaccinated them. Well, I myself was not vaccinated at all during my babyhood, and I remained healthy. So that adds up to my questioning. But this story really blows up my mind. Yeah, I am lucky to have these two healthy kids of mine. But I completely forgot there may be a lot of other children that have medical issues, that rely on the community to protect them. Once again, thank you for sharing this wonderful article. I think every parent should read this! How are the vaccination rates in Singapore? Thank you for reading – feel free to share. 1. Get your child vaccinated as per the schedule and on time. 2. Get your child’s titers blood checked for every disease after they have received the vaccinations. 3. Get boosters for any disease that the lab results confirm your child is not immune to. 4. Repeat 2 and 3 until you are 100% sure they are 100% immune to everything. Should I ensure this is done before letting my child out in public or to attend school? Yes – that is the prudent thing to do – if you want to make sure your child is properly protected against the diseases we vaccinate against. One blood test can check the titers, so it’s not something that would need to be done over and over and over again. Most people have protective titers after the first round – some times a booster is needed… unless there is a real immune deficiency that is causing you not to develop protective titers at all. Thank you, Jessica. The mom who wrote this is a close friend of mine and I know her little boys very well. She is not an alarmist – but a realist – her struggles are real and not hypothetical – and I HOPE that’s what people will see and feel when they read her post. Thank you! Coming from a mom who, with her eldest, had him on a delayed vaccination schedule, I now absolutely support vaccinating 100%. All my kids are now vaccinated according to schedule, and what really made an impression on me was kids like Camden. Sure, it’s one thing to not vaccinate your kids by choice, but what about kids who, because of cancer or medical conditions, can’t get vaccinated? What are parents supposed to say? “oh well”? Medicine has made great strides and we should use its tools to improve our lives. I don’t talk about vaccines really because I feel like most people are set on their opinions, but that’s where I stand. I think what would help make “on the fence” parents like I was more sure is to stop making this a ‘debate’ and implement rules. I think some states including mine are starting to make laws removing that waiver she talked about in the article, especially after the crazy measles that broke out here. About time! I am so sorry for what happened to Camden. It is heart breaking to hear about any person, particularly a child suffering in any manner. I can’t image the stress and concern that you as his parent went through. I am so glad that you talked about how just because a child is vaccinated that does not mean that they are protected. I think that many parents do not realize this fact. Even if you get the blood work checked and it comes back as ‘having taken’ in rare occasions you can still get a disease. Another issue parents often forget about is that they need to have boosters themselves in order to help protect themselves and those around them. All of that said I have a really hard time reading articles on vaccinations right now.I believe that vaccinations in general are beneficial to our children and society. However, there are always grey areas. For my children I struggle with the vaccination schedule and how it varies so much region to region (The variance in first world countries is huge but so to are local areas). The other concern I have is with the variance in ingredients. I am in Canada and Thimersol is only in 1 of childhood vaccines so it is other ingredients which I am referring to. In the end we decided to do a slightly delayed vaccination schedule for our children stretching our local 18 month recommended schedule out into a 2 year one. More than that though the division, disrespect and cruelty that abounds right now over this debate is so disheartening. I cringe everytime I hear the term ‘anti-vaxer’ because that is such a dwindled down label that has a negative connotation associated with it. Support, education and encouragement always go so much farther in furthering any cause. I agree – I hate the disrespect and the venom between the two camps – it’s a shame that there can’t be a more civil dialog. You go girl! I teach at a private preschool and we do not allow unvaccinated children, luckily! Thank you for your post! Outbreaks of chicken pox, measles and polio kill children in African communities each year. My stepdad had polio; the first child in our state in the early 1930’s. He was one of the first polio patients at Children’s Hospital in Seattle, driving here in a Model T from a small town and walking to treatment on crutches when he was out of the body cast. He was blessed not to be in an iron lung. After treatment, he lived with a brace on one leg to help him walk because the muscles had completely died away. He had many health complications during his life, now known as post-polio syndrome. Before he died, his body suffered so much arthritis, muscle atrophy and other complications, and spent quite a bit of time in a wheelchair. When he got the polio virus, he was isolated from his family in a shed in the back of his house on the family farm. No one could be with him, parents, brothers or sister. He was alone. At 7 years old he stayed for over a week alone, while his dad brought him meals and his mom took care of his siblings. When I remember my dad telling me this story, and think of the sadness polio brought his family and the life of suffering he endured, I think that my children are so blessed. 85 years later, we as medical consumers, have the power to do what is in our children’s best interest, andwhat is in the children’s best interest who are in our schools, communities, countries. Be empowered by a story like these and bring your questions to your pediatrician or the World Health Organization (WHO), National Institute for Health (NIH) or your local children’s hospital. As the mother of twin boys with Autism Spectrum Disorder who have both been fully vaccinated, allow me to make this statement: Autism is not a death sentence. It is not something to fear. It is not something that needs a “cure.” Measles, pertussis, chicken pox, etc. can kill your child or someone else’s. To everyone out there on the fence on this issue, please vaccinate. If you’re concerned about vaccinations, you can do a less aggressive vaccination schedule, but vaccinations were invented to save children from illnesses that kill and maim. Autism is a matter of neurodiversity. They are constantly coming up with new reasons behind what causes it, and really, no one knows! Also, with the exception of severely autistic individuals, it is not a tragedy, it is a difference. Autistic adults don’t generally want a cure, they are happy with the way they are. Stop being afraid of an eventuality that isn’t as scary as you think it is and putting your child at risk for something that could actually kill them! Lorraine – thank you so much for weighing in with your thoughtful perspective. I am so glad to hear from you and I appreciate your feedback. I am sure life is hectic with twin boys, but also entertaining! Thank you for stopping by – this is great input! Very well written! Most of the moms who oppose vaccination are so poorly educated. How can they claim to know more than the American Academy of Pediatrics, the CDC or the WHO? If more than 95% of pediatricians vaccinate their own children, you can trust them to make healthy choices for your own children. Thank you! – Great point about pediatricians! Thank you for sharing.